← How Important is Heritage? In the Bible it says that God made man in His own image. What I have seen a lot of is the opposite – man making God in his own image. I grew up in a neighborhood that was largely Italian. As I saw the various images of saints, they mostly looked Italian. Later when I was in Germany, I visited a Cathedral and to my surprise, all the same saints looked German. The classic “Nativity Scene” is very Italian in its look but that is no shock when one realizes that the nativity as we know it is based on a vision St Francis of Assisi had while in Grecio in 1223. Now that I am in Texas it is interesting to see the Spanish/Mexican influence on religious art. The photo accompanying this article was taken at a local taqueria (roughly taco stand for those of you not blessed enough to live in the Lone Star state). In it you see the Holy Family (or Sacred Family as the title says, La Sagrada Familia). 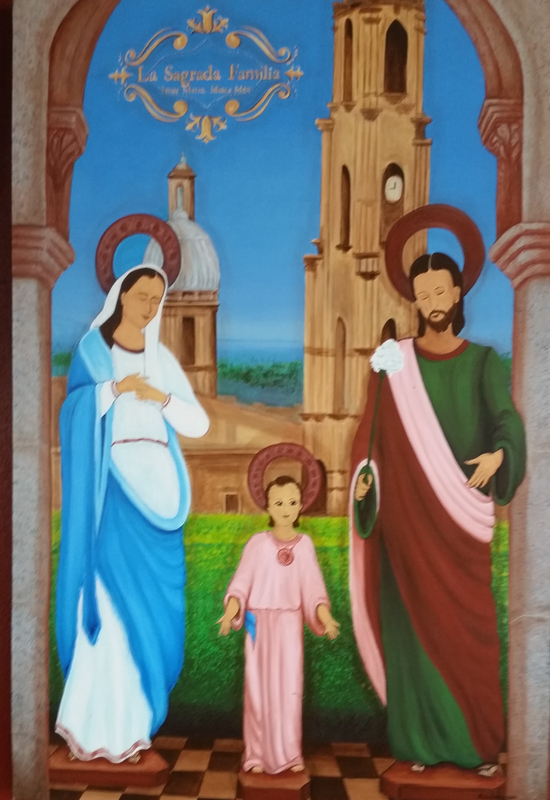 There we have Mary, Joseph, and the young Jesus with Hispanic features and a lovely Spanish styled Church in the background for a little creative anachronism. These observations started me thinking. First, the good thought – the Gospel is for everyone in everyplace and in every timeframe. To adapt the way a person sees Jesus allows for what would be foreign if confined within a Middle-Eastern image to become personal and acceptable. There is a bridging of a gap that might otherwise be too much to overcome. Too take a bit of license to the words from the Apostle Paul; this is Jesus becoming all things to all people that some might be saved. Then there are the bad thoughts that came with this. Christians are called to be Christocentric – Christ Centered. But making God in one’s own image is to be self-centered. I am not so worried about the artwork described above and some other pieces you have likely seen. I am worried about some of the things I have seen peddled as “serious study material” at the Jesus Junk Store (AKA the Bible book store of whatever brand is your favorite that has a smaller collection of books than the religion section at Barnes and Noble but shelf after shelf of Jesus-themed kitsch). To illustrate my point I would like to provide you a not so short list of “study” material currently on the shelves of the local Jesus Junk Store. You are probably thinking that I made at least a couple of those up but I assure you they are all on the shelves – and sadly many more that I could not fit onto my scrap of paper that day. This is nothing new. Those old paintings of saints dated many centuries old. Every era, place, people group, has its own way of understanding God. But the world would be much better off if we would do as the Bible (not the self-serving stylized notes in the “study Bible” of choice) says and be transformed rather than conforming to the world – or even worse, trying to force God to conform to the world we know. This entry was posted in Christian Living and tagged Vanity. Bookmark the permalink.